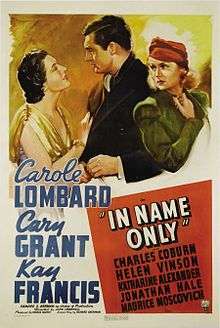 In Name Only is a 1939 romantic film starring Cary Grant, Carole Lombard and Kay Francis, directed by John Cromwell. It was based on the 1935 novel Memory of Love by Bessie Breuer. The fictional town it is based in, Bridgefield, Connecticut, is based on the town of Ridgefield, Connecticut. Alec Walker (Cary Grant) puts up with a loveless marriage to Maida (Kay Francis) until he meets widow Julie Eden (Carole Lombard). They fall in love and he asks his wife for a divorce. She refuses; as she goes on to tell him, she married him solely for his social position and wealth and won't give them up. She is such a skillful liar that she has Alec's parents (Charles Coburn, Nella Walker) convinced that Julie is out to destroy the marriage. Julie breaks up with Alec since she cannot see any future with him. On Christmas Eve, a distraught Alec gets drunk, falls asleep in front of an open window, and becomes deathly ill. At the hospital, Dr. Muller (Maurice Moscovitch) tells Julie and Alec's father that the patient is likely to recover if he has the will to live. Julie lies to Alec, telling him that Maida will let him go. When Maida shows up and tries to see Alec, Julie blocks her. With no one else in the room, Maida freely admits she gave up the man she really loved for Alec's position and his father's wealth. However, Alec's parents enter behind her and overhear her cold-blooded admission. Maida's plotting exposed, the path to Alec and Julie's happiness is now clear. According to Robert Osborne, the film was intended to reteam Katharine Hepburn and Cary Grant. However, the disastrous reception of Bringing Up Baby led to Hepburn being considered "box office poison" and Lombard being cast instead. The film was praised by critics: Variety's critic wrote: "In the steering of the story director John Cromwell has made every situation as believable as could be accomplished in order to sustain the dramatic undercurrent, strife and the beleaguered romance which has developed. Cary Grant and Carole Lombard emerge highly impressive." "Soap opera par excellence," wrote The New York Times Frank Nugent, "blessed with a peerless cast." Despite both Grant and Lombard playing against type, the film was popular and earned a profit of $155,000. ↑ "Turner Classic Movies". Tcm.com. Retrieved 9 June 2016. ↑ "Archived copy". Archived from the original on September 27, 2015. Retrieved September 26, 2015.